I painted my washer and dryer again. So I needed to spice them up a little. 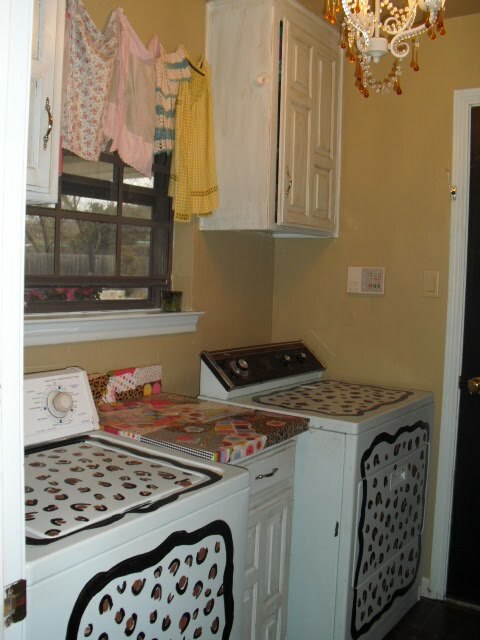 Hopefully when we move we will be getting a new washer and dryer set. And hopefully it will be they will be shiny and RED! Thankfully I have the kind of husband that does not bat an eye at these type of things that I do. 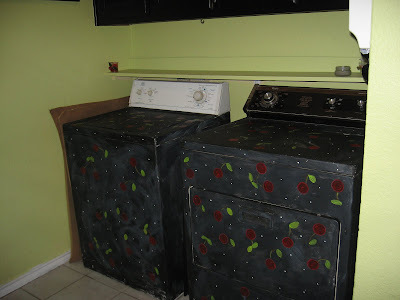 Although, when I was painting the leopard spots on the washer, he asked if they were walnuts?!! That made me laugh out loud for about 5 minutes. OK girls, I am registering tomorrow for baby stuff and I am dreading it a little. It's so overwhelming! I usually pick cute over functional. I've heard you can't do that with baby stuff. So please let me know some "have to have" things for a baby. So far I have ordered her bedding and I got her a super cute yellow polka dot bathing suit with a matching hat. So I am thinking we will need a few more things. You will need a Boppy for sure regardless of you feed her. Some kind of sling is pretty priceless early on. I had a Hotsling and a Baby Bjorn. Didn't have either with my first and after I got them, I don't know how I made it without either. A pack n play is really awesome. Especially if you travel. Don't waste money on too many newborn clothes. They outgrow them too fast. I know I'll think of more so I'm sure I'll be back! about 4 crib sheets, at least 2 mattress pad covers, PLENTY of birth cloths, bottle of alcohol (rubbing! ), a million onesies (it really is true...you an never have enough), about 2-3 changing pad covers, I could go ON and ON!!!! Love the fridge- do you have a Mary Engelbreit theme in your kitchen because that is what your fridge reminded me of! I would not register for blankets and bibs because you will get a billion of them. nothing is in order of importance, just what I think of. 4. diapers (now, you'll prob. get several brands at showers and such...DO NOT open but ONE pkg. b/c you may find out the baby is allergic to a certain brand, or you may just not like it as well as another....so, TRY out diff. brands) You can take the pkgs back and return them if you need to. 5. clear and white diaper ointment....NEVER (please don't) NEVER rub the white cream on a very rashy bumpy bottom, the white ones' have zinc oxide in them and will burn a severe rash. Try to use a little ointment or cream pretty often (or baby powder) as a preventative. 6. Try out diff. bottles as well, you may end up not liking a certain bottle that you've received alot of. Like maybe try out 2 or 3 diff. brands and see which you like best. 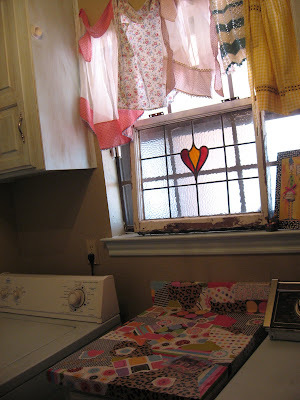 10. extra crib sheets, at times i changed and washed mine daily b/c of spit up or diaper leaks. i LOVE your blog & have never commented, but now that i am a mom to three i think back about registering & don't blame you for feeling overwhelmed! there is a lot of stuff you don't need and some great things you do need! i highly recommend a decent bouncy seat, the 'swaddlers'* that come with velcro, the book 'The Baby Whisperer'* and an excellent swing. ours were major spitters so burp clothes were of the essence, too. little terry cloth covers for the sheets were helpful also. you tie them on the crib slats & they are about a foot wide. then you don't have to change the whole sheet, but just switch out the little cover & put a new one down. you can read reviews on a lot of products/brands, etc online at amazon or target to find out what is best vs what looks good. my advice would be $$$ doesn't always mean better. things i wished i hadn't wasted money on - baby bath tub (kitchen sink or a shower with me worked better), wipes warmer, diaper champ (so much easier to just take them out every time - i felt it made her room smell; we gave it away after our first) and a sterilizer (just as easy to throw stuff into a pot of boiling water). all the other stuff just takes up space! :) good luck! * i didn't have either of these two things with my first two children & i highly recommend them. they made a huge difference on round 3! also, the dvd 'dunstan baby language' - i got it from the library thinking it would be a total crock, but it worked! i wrote the sounds on a little notecard & carried it with me everywhere. even my little girl was into helping figure out which sound our baby was making & why. it was huge! A good baby sling/wrap is a necessity. Not only are they great for bonding, but they're also proven to help with colic, and it's so nice to keep your baby close by...plus, they're cute! Hey!!! I just love your sense of Style !!! I just had our 3rd baby in Dec, We have a little girl who just turned 5 a little boy who will be 3 in July and our daughter Meya who is now 3 months! I would say a few things that have made my life so much easier are def the Maya wrap a boppy, 3-4 crib sheets and by far one of the best things we have (since our 1st was born and have used it since ) is the Fisher Price Portable highchair it folds,it's great!! but by far my favorite is the Maya wrap! Great for hands free and lots of snuggling! Good luck and have fun!! I don't blame for feeling overwhelmed! It's so overwhelming but tons of fun too Enjoy!!! changing pads- come in a set of three at target, you put them over your cute changing pad cover and then when you have accidents you don't have to wash the whole thing! I LOVE my Summer Infant Tiny Diner Placemat (in pink!) it's cute and OH so functional!! I consider it to be almost as necessary as a carseat - I promise you will not regret the $12 to get one!! I am back to say do NOT waste your money on a diaper genie or champ. We buy the box of lightly scented bags at BRU. It's like $8 for 100 or more. We keep them on the changing table and if it's just a wet diaper, we use the bag til its full. If it's a dirty diaper, we just tie it up and out it goes to the trash can in the garage. So much cheaper and keeps the nasty smell out of her room. I'd also recommend a shopping cart cover. I honestly used to think they were silly, but I have found that in the winter, they not only reduce the number of nasty carts she is exposed to, but also keeps her a bit warmer. And my favorite diaper rash cream is Dr. Smiths. It is amazing! And we've tried them all. It's seriously sooo much better than anything we have ever tried. It's hard to find, though. The only place we can find it is Kroger. If you plan on nursing, I wouldn't register for any bottle stuff. We got lots of bottles and NEVER used them. Blankets are great, books (something most forget about), extra sheet for the bed, mattress pad, baby gate, umbrella stroller, a toy the baby can lay on and look up and play. Bibs, nice soft thick ones, incase she's a spit upper or a drooler, then you don't have to change her outfit everytime, just put a new clean bib on. you know what my suggestions are... the only one you must look at is www.newnative.com that is where i got my sling and love it! so much to think of - good luck!! and call if you want! My suggestions are more for your shower. Or for who ever is throwing your shower. 1~ask for books instead of cards. It is a great way to start a book collection for Katie Belle. And it is neat to have them with a personal message in them. Plus I think cards are a waste. 2~do a diaper raffle. have a prize or a few and who ever brings a package of diapers gets a ticket for the drawing. Lots of burp rags and onezies! A great swing, bouncy seat and pack and play. Those were my must haves. Ready for some lunch? My appetiete it huge! MLB-Bedding.com has best selection of MLB Bedding, MLB Baseball Bedding, Mlb Logo Bedding, mlb team bedding with huge Discounts. MLB Bedroom gear, baseball blankets, baseball Pillows, Comforters, Valance. #1 I hope you get Dr. Brown bottles. We got "Avent" and they leaked...my best friend had the same problem. We both finally got the Dr. Brown and love them 1 million times better. They really are better. #2 "Sasha" the giraffe. A French chew toy (google it) best, cutest chew toy I found. What in the world...??? MLB bedding? SO confused.